If you’re searching for a destination where you can experience Native Hawaiian culture, enjoy wide-open spaces, and take advantage of scenic beauty and enticing adventures, then Molokai is the place for you. 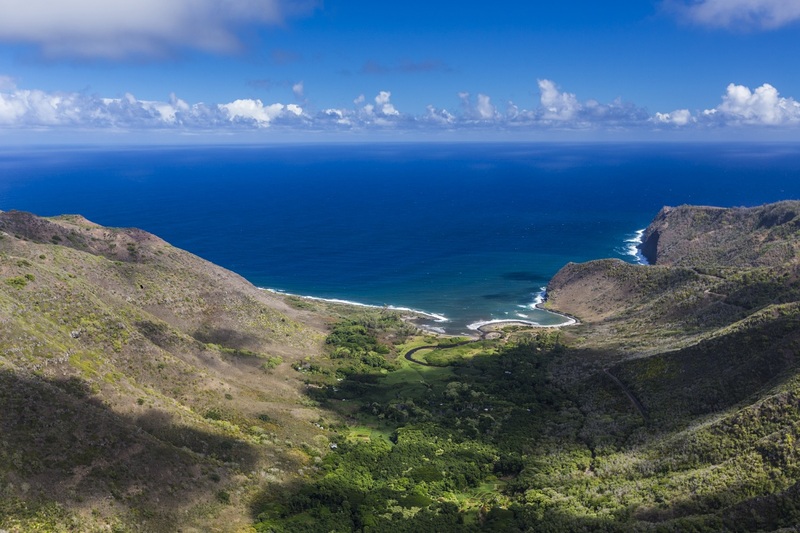 You won’t find skyscrapers or stoplights on Molokai (and you’ll only find about 7,000 people living there), but you WILL find friendly people, a love of the land, and the highest sea cliffs in the world. Molokai, or The Friendly Isle, is Hawaii’s fifth largest island, but it’s only 38 miles long and 10 miles wide at its widest point. Molokai is separated into 3 regions: Central Molokai, the West End and the East End. Molokai is in the center of the Hawaiian Island chain and is just 25 miles southeast of Oahu, eight miles away from Maui. Two volcanoes formed Molokai: Maunaloa on the West End and Kamakou to the east. Spend some time in Maunaloa Town, and you’ll notice it is drier, flatter, and more arid here than in the rugged, verdant valleys of East End. Eastern Molokai features largely inaccessible mountains and sea cliffs. Mt. Kamakou is Molokai’s highest point (4,970 feet) and the sea cliffs of the North Shore Pali are the tallest in the world (3,600 to 3,900 feet). Kalaupapa Peninsula juts out from north central Molokai, home to the isolated Kalaupapa National Historic Park. One of the oldest known Hawaiian settlements on Molokai was in Halawa Valley, an area you can still explore today. Hawaiian Fishponds built hundreds of years ago can still be seen along Molokai’s southern coast. Molokai is also said to be the birthplace of the hula. Legends speak of Laka, who practiced the hula at sacred Kaana near Maunaloa and spread this knowledge to the other islands. Western contact came to Molokai in the early 1800’s by Christian missionaries. Kaluaaha Church was Molokai’s first Christian church, originally built in 1833 (today’s structure was rebuilt in 1844) on the southeast coast. In the late 1800’s, King Kamehameha V built a vacation home in Kaunakakai. Halawa Valley: It is believed ancient Polynesians settled in lush Halawa Valley as early as 650 AD. With many hidden heiau(places of worship) it’s easy to see why this area, half a mile wide and three to four miles deep, and blessed with beautiful vistas and towering waterfalls, is one of the island’s most historic areas. Roughly two miles up the trail is the impressive, double-tiered 250-footMooula Falls. If you’re considering taking a dip into the pool, drop a ti leaf into the water first. Hawaiian legend says that a giant moo(lizard) lives at the bottom of the pool. If the ti leaf sinks, the moo is in no mood for visitors. If the ti leaf floats, it’s safe to enter. The hike in is moderate, and the only way to explore the area is with a guide, since the trail crosses private property. You can contact the activity desk at the Aqua Hotel Molokai to arrange for a guided hike. The long drive to Halawa Valley (roughly one and a half hours from Molokai Airport) is an adventure in itself. You’ll pass by Hawaiian Fishponds, points of interest like Kumimi Beach (also known as 20 Mile Beach or Murphy Beach), Kaluaaha Church (Molokai’s first Christian church built in 1833), Halawa Beach Park and Halawa Bay. Halawa Valley is a great place to hike and picnic. Plus, you get an awfully nice view! Kalaupapa National Historical Park: This special community was once home to Belgian missionary, Saint Damien, and later, to Saint Marianne Cope. In 1873, Father Damien chose to leave the “outside world” to care for Hawaii’s Hansen’s disease victims who were exiled to this isolated peninsula. After 16 years of faithful service, he too, tragically succumbed to the disease and was laid to rest at historic St. Philomena Roman Catholic Church in Kalaupapa where you can visit his grave. A few months before Saint Damien’s death, Mother Marianne Cope came to the island. She had been the head of her religious order, an accomplished hospital administrator at the St. Joseph’s Hospital in New York, and oversaw several hospitals and care homes in Hawaii. At Father Damien’s request, she and her Franciscan sisters volunteered to live out their lives in the exiled community, operating the Boy’s Home he established and the Bishop Home for Girls. The beloved Mother died in 1918 of natural causes. Her remains were buried on the grounds of the Bishop Home and returned to Syracuse, New York in 2005. Today, the serene Kalaupapa National Historical Park is a place of preservation and education and is only accessible by mule ride, hiking tour or airplane from the small commuter Kalaupapa Airport (LUP). Kalaupapa cannot be reached by car. To take a Kalaupapa tour, make a reservation in advance with Damien Tours, (808) 567-6171. For mule ride information, call Kalaupapa Mule Tour at (800) 567-7550 or (808) 567-6088. You can also view Kalaupapa Peninsula from the 1,000-foot elevation of Palaau State Park. This 34-acre recreation area offers winding trails among eucalyptus and ironwood trees as well as breathtaking views of Molokai’s north coast. 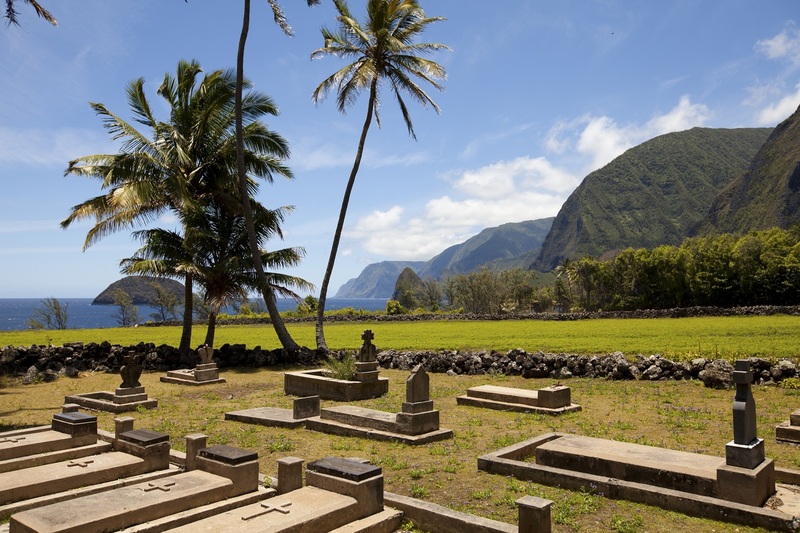 Father Damien is buried at the Cemetery at St. Philomena Church in Kalaupapa. Kaunakakai: This charming paniolo (Hawaiian cowboy) town is also the island’s main harbor, where some locals still fish for their dinner. Stroll down to Kaunakakai Harbor to the end of the state’s longest pier, extending well past the reef. The town’s main strip, Ala Malama Avenue, was named after the nearby house used by King Kamehameha V in the 1860s. You’ll find it easy to browse the shops and boutiques of its business district. You’ll find crowds at the famous Kanemitsu’s Bakery, where locals and visitors alike line up after hours to get piping-hot loaves of fresh bread. Stay the night at the Aqua Hotel Molokai, a Kaunakakai landmark located on Kamiloloa Beach, or find a condominium or cottage rental. Then be sure to visit the [haw]Kapuaiwa Coconut Grove to see palm trees in one of the last royal coconut groves. Across the way you’ll discover “Church Row,” the site of seven small, missionary-style churches, some dating back to the late 19th century. Popohaku Beach: Papohaku Beach is also known as Three Mile Beach, where you can enjoy three miles of soft-sands uninterrupted down Molokai’s west end. One of Hawaii’s largest white sand beaches at about 100 yards wide, there’s plenty of room to spread out and enjoy the “Friendly Island” ambience. Here you’ll find campsites, indoor and outdoor showers, as well as picnic and restroom facilities. There’s plenty of space to enjoy a beautiful view of Oahu. Over the Kaiwi Channel, just past Leahi (Diamond Head), is Waikiki, which took sand from Papohaku years ago to help build up its own shores. One Alii Beach Park: This favorite of Hawaiian alii (royalty), just east of Kaunakakai has picnic facilities, restrooms and parking, so it’s a great place for a day in the sun with friends and family. Kiowea Beach Park: Although not an ideal spot for swimming, Kiowea Beach Park is just east of the Kapuaiwa Coconut Grove and is another great picnic spot as well as an excellent place to watch the sunset. Papohaku Beach Park: At three miles long and one mile wide, this is one of Hawaii’s largest white sand beaches. There are restrooms, but no showers or lifeguards. Great for sunbathing, use extreme caution when swimming during high surf, especially during the winter months. Kapukahehu Beach (Dixie Maru Beach): This small sheltered cove is great for swimming. Again, be cautious during high surf, especially in the winter months. This is also a fantastic spot to watch the sunset. Note there are no facilities here. Halawa Beach Park: As you approach Halawa Valley, Halawa Beach Park offers a secluded bay that is great for swimming, however exercise caution during the high surf of the winter months. Picnic and restroom facilities are available. Molokai has just the right amount of culture, adventure, and history to make anyone’s trip here worth veering off the beaten track. So, consider making Molokai your Hawaii destination, and experience how enjoyable a slow-paced vacation can be.